Well, once you have taken a step into the real world, the real life begins. The real life consists your career aka your future. What do you think is the first step towards forming your career? Is it searching for a perfect job? Yes, you got it right. NEXT? It would be applying for the job. PERFECT. NEXT? Preparing for an interview is the next step. So, now that you have successfully booked yourself for an interview how would you prepare? Excitement and anxiety are definitely going to grab you by your collar (even if it is not your first time). Thus, you need to prepare well for making the best out of this opportunity. What kind of preparation do you need to do before any interview? As a part of interview preparation, best interview outfits also plays an important role. The best way to start your preparation for a job interview is by listing down all possible things that you need to look or brush upon before your interview. Well, is your preparation limited to brushing up skills? There are things that you need to consider. For example, think about what you will wear for the interview i.e interview dress. It is true that talent matters the most, however, appearance does matter when it comes to the face-to-face interviews. The way you look for an interview defines you. First impression is the last impression. Therefore, if you look good then your resume will automatically get a better chance. 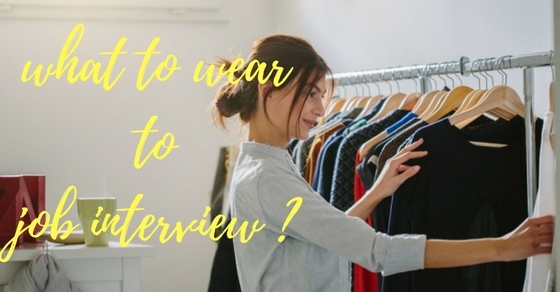 Before going through the best interview outfits list for various workplaces (depending upon the work field) let us go through the outfits or attires that you should straight-out reject. Well, imagine yourself in an interview, where you are tugging down the hemline of your shirt. Imagine yourself adjusting your top every few seconds. Would you feel distracted and less confident? Of course, you would be distracted. As a fact, even the interviewer might take it as a distracting sight. This will indirectly lessens the interest of the interviewer in the ‘interview’. Moreover, unfitting clothes will definitely make you more conscious about your appearance. Furthermore, due to ill-fitting clothes you are bound to feel uncomfortable and lose your confidence more. To sum it all up in one sentence, I must say that ill-fitting clothes are a ‘huge no’ for an interview. If the clothes are newly tailored then try them a night before the interview. This will make you accustomed to the fabric too. At certain places, employers themselves opt to go with a casual dress code. The word casual in an interview does not refer to shorts, miniskirts, faded jeans, t-shirts (with printed quotes or brand name), hats, fancy shoes or 6-inch heels, flip-flops, etc. Casual clothing and overly casual clothing have a very thin line between them. Therefore, make sure that you do not over do your casual attire and stick to an appropriate wear. Avoid bright flashy color as it might highlight your existence but not your personality. In addition, men should definitely drop away the option of fancy or overly patterned ties. Overly patterned ties are simply outdated. So do not take ‘casual’ casually. How many of you agree that standing out from the competing crowd is very important in an interview? Yes, I would not deny the fact that standing out in an interview is very important. However, there is a very thin line between standing out with extra ordinary attire versus looking flashy and distracting. As I have mentioned earlier that flashy and distracting attire is a huge no as it takes away the attention from your skills, talent and personality. Make sure that you let your talent and skills speak. At the same time, (for women) does not wear clothes that are revealing or have a low cut. Those clothes make you look highly unprofessional. Unprofessional look is the last thing you want to carry at an interview. Do not try to make yourself look all funky and trendy with high (above 3 inch) heels, sundresses, low cut tops, etc. Similarly, men should also make sure to stick with less trendy yet sophisticating look. Colors like grey blue and black are ideal. That strong yet classy fragrance makes your day complete, does it not? Well, what if the interviewer has an allergy or is uncomfortable with the smell of it. Your fragrance may be an aroma to you, but you never know, it may be an odor for your interviewer. Now, you might say that no one hates a little fragrance. Therefore, I would like for all of you to imagine this little scenario in your head. Well, you are the interviewer. You are sitting in a close cabin. One of your candidates is wearing an axe deodorant. His aroma is all over the place. As soon as he exits, another interviewee enters with a different fragrance. Now tell me, would you not feel dizzy and irritated with the distracting smell? Of course, you would. Therefore, try to avoid it. Tip: Women, do not go for twinkling, jittering, jangling accessories. They are much more distracting than any other thing in the world. For an interviewer, a bad impression means an easy decision. A person who turns off an interviewer through an indirect rebellious attitude is directly forwarded into the rejection list. A rebel does stand out but not in a positive manner. If you are unsure, on what to wear you can approach someone who has the knowledge of it. 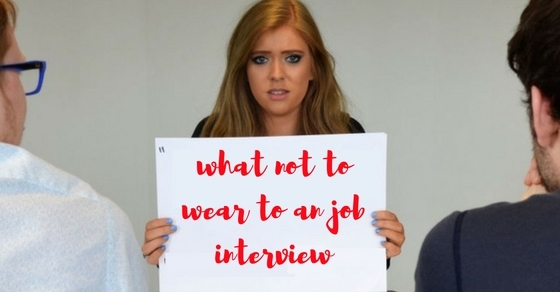 You can ask the person, who had set up the interview, regarding any instruction or suggestion for the dress code. It is as simple as that, right. With that, I completed the list of things that you should not consider. However, do you know there are various fields all around the world? Not all places require you to come up with the typical workplace attire. Every job demands appropriate attire. Therefore, let us have a look at the best interview outfits in various fields. This question is one of the frequently asked questions. Thus, one could easily understand the importance of appropriate and perfect appearance. Let us glide through some appropriate (almost perfect) basic outfits for different types jobs. The creative team includes people like writers, editors, photographer, photo editors, film (director, actor, etc. ), graphic designer, choreographer, etc. These are the people whose personality and talent do not simply flash through the clothes. However, perfect interview attire is equally necessary. One should keep in mind the position they are appearing for and dress for interview accordingly. Men can go with semi casual attire. It should be a comfortable pair of denim in dark blue or black color. And not so fancy shirt should go well with the denims. To top it up you can invent in a blazer. It will cunningly give a polished finish to your job interview attire. As for the accessories, do not carry loads of flashy item. Keep it casually simple. Women have a hard time deciding on what to wear. Innumerable dresses in the wardrobe may tempt you to grab them and wear. However, you need to look casually presentable. Do not choose something that suggests an after party (right after the interview). Like men, women can apt for dark denim or leggings. Wear a comfortable light-colored shirt. A button up shirt with one or two buttons off will do too. Do not forget a bag- sling bags will work fine. Go for delicate and simple accessories. Close toe shoes or heels less than 3 inches are advisable. The numerical set of people include people from banks, consulting firms, accounts, insurance, hedge funds, research, market analyzing firms, etc. These people have a partially serious job. Their interview attire requires a bit more formal touch than compared to the creative ones. Do not plainly go for a suit, as finance firm does not demand it. A business casual look is an ideal one for these types of interviews. You can opt for a light colored button down shirt. Do not go for bright and flashy colors. A grey or black blazer may work fine with the look. This look is partially a formal one and it works well within the workplace and still looks classy and stylish. Did I mention the tie? Well, if not then please take a note. A simple and less complicating pattern will fit in with your best interview outfits. Women can also opt for a pantsuit. However, skirt suit will work too. Go for a light colored blouse or shirt underneath. Pair it all up with delicate and conservative accessories. High heels, open toe shoes, sleeveless tops, and frumpy clothes are a ‘big no’. Instead of going for wedges or shoes, you can go for pumps too. The corporate sector is the sector that includes people from firms like the law firm, real estate business, PR or the public relation firms, marketing and sales, advertising or private organization. Men definitely do not need much advice on this department. However, you need to keep the following things in mind. Take care of your grooming needs. Your perfect attire for interview will have no effect if your hair is all over the place. A formal white shirt will work well with a finely tailored pantsuit. Pair it up with a classic watch and leather shoes. Be classic and avoid vibrant colors. Like men, women also need to take care of their grooming needs. Do not put on too much of make-up. Keep your hair clean and avoid wearing perfumes. A nice blazer over a shift dress will look classy, simple, and appropriate. A blouse paired up with a well cut trousers will also work well. You can add workable heels to polish your look properly. You can add a purse or bag along with it. Fashion jobs go along with a lot of confusion and misunderstanding when it comes to interviews. The people that include under this category are fashion editor, designer, assistant, merchandiser, buyers, stylists (hair, clothes, makeup, etc.). A trendy and edgy look is highly not advisable. Your job description may bring about certain changes with your attire. However, try to avoid designer outfits and invest in trendy accessories instead. The rule applies equally to both men and women. Your stylish watch, bags and shoes will easily portray your creativity. Make sure to be under ‘He or she looks presentably creative’ instead of ‘that must be expensive designer clothing’. The techno people are a set of people that include people like the engineers, designers, communication consultants, product managers, gamers and coders, Information technology, strategists, etc. Unlike other fields, techno people are mostly the youth of today. They are young, energetic and vibrant with collegial attitudes and aura. Job interview outfits in this field can prove to be a tough task as you always have the fear of being overly dressed. Over and under can turn off the interviewer and change the interest of the interviewer (in you) drastically. For a techno job, you need something in which you feel comfortable. Wearing a random yet comfortable button down shirt and pant will be perfect. Perfectly trimmed hair with light beard will suit you. Pair your look up with a regular leather watch. Add a pair of shoes to your look and get through the interview. Like men, women also need a casually comfortable outfit. Wear well-tailored dark jeans with a light colored button down shirt. Your shirt can be a simple plain shirt or a checkered shirt. Polish your look with a watch or band and a classy handbag. Add your walk-able / workable heels (close toe) and you are ready. Interviews play an important role in the candidates’ lives. It is not only the first step towards making a career but it also plays an important role in shaping and boosting the confidence. Thus, you need to learn from your bad experience or yet better learn from other’s bad experiences and do well. All the very best job seekers. How to Use Google Alerts in Your Job Search Effectively? Text or Visual Resume: Which One Grabs Recruiter Attention? How to Write a Resume for the First Time?